Flash Drives: Any self-respecting geek should have some form of portable drive. And not just one or two--you should have an entire collection of them. You should know then how to partition your flash drive properly. Your flash drives should contain a collection of system utilities and perhaps a Linux installation or two (hat tip to Joe S. on our Facebok page for the tip!). My box o'wires. Yours needn't be this messy! Cables-Lots of Cables: Having a box of miscellaneous cables is great. It isn't only useful for finding a spare in case a cable goes missing, but you'll also have cables for just about any unforeseen circumstance. You’ll probably find the box will be mainly made up of Ethernet cables, but this is good for wiring up your whole house. Don’t forget to put a cable in your bag (be it a USB or a specific charger cable) just in case your latest cool gadget, laptop, or otherwise runs out of juice, or needs hooking up to a PC. A Home-built PC: Nothing shouts Geek cred like a homemade computer. Not only are you proving how well you can navigate yourself around a PC, but it also means you got to pick what went inside--faster RAM, big memory, impressive graphics and maybe more than one monitor are just a few examples of how cool a geeky homebuild is. You should have just about every screwdriver imaginable, as well as an anti-static wrist-strap set (hat tip to Simon on our Facebook page for the tip!). Geek Tech blogger Chris Brandrick modelling a geeky Threadless tee. A Geeky Tee (Or Two. Or Twenty. 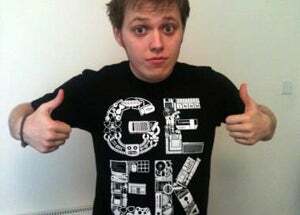 ): Chances are, you'll wear your geekiness on your sleeve--literally--with a geeky tee. A geek slogan or motif or something to do with geek culture are all legitimate and potentially cool. If you’re looking for a cool geeky tee, there are plenty of places online to find good ones: Pop + Shorty has a couple of sweet t-shirts aimed at the fashion conscious geek, and Threadless occasionally sells some great geek-friendly designs too. And of course, it never hurts to add some geeky buttons. If you're a Web designer, you might appreciate this one (pictured at top). How to Code: All geeks should have even a basic degree of coding knowledge. Depending on what coding you find most interesting--be it computer programming or Web design--you should be able to lay down the basics from memory. For instance, if HTML is your thing, you really ought to know your img src from your a href. If you know the HTML basics--plus a little about CSS and how it works--you get bonus points. Keyboard shortcuts: Knowing your way around the keyboard is pretty useful, especially if the time comes when your mouse stops working and you need to stop what you are doing and shut down (and we have all had those kinds of mouse issues). Plus, keyboard shortcuts are mega useful in programs such as Photoshop--they save a ton of time. On the desktop, the best of you will know how to rotate screen (and know that not all computers can do this, as it depends on the graphics card), bypass the recycle bin, run the command prompt as an administrator, or create your own shortcuts. Then there are all the neat shortcuts available to a savvy time-saver in web browsers too (here’s a good one for mainly IE users: type a word into the address bar, then press CTRL and enter). Any other ideas and suggestions? Leave a comment!